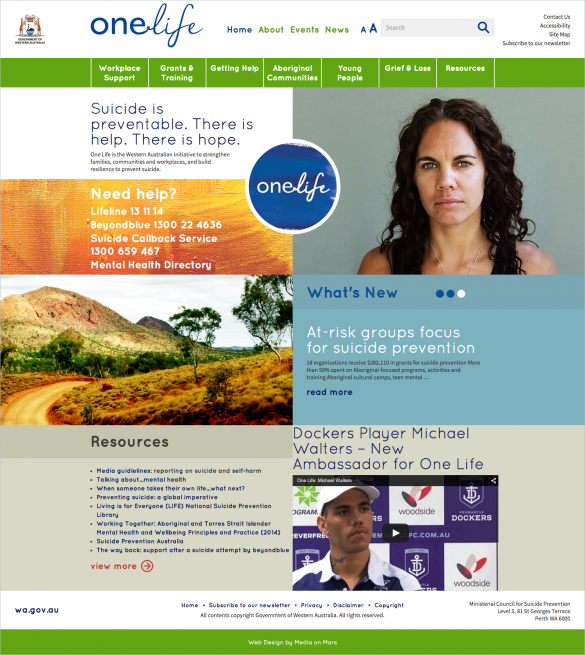 The Western Australian Suicide Prevention Strategy – One Life is implemented by the Mental Health Commission (MHC). In 2014 the MHC commissioned Media on Mars to custom design and build a website for One Life. It’s a hub of information and support services geared to strengthening families, communities and workplaces, with the aim of building resilience in order to prevent suicide. The MHC realised that their old website was too corporate. The messages needed to come across more directly and to connect in a human way to make visitors feel more comfortable. The Commission wants to empower people to seek help. There was a deadline to meet too – the site needed to be up and running for their busiest campaign time of the year – Mental Health Week, the Life Awards and R U OK day. At the first stage of rebranding our priority was to inject life and hope by using colour, texture and strong imagery. Before starting on the website structure we determined the profiles of the primary at-risk groups. This resulted in creating a site of micro-sites i.e. each section is targeted to a particular group, such as young people, aboriginal communities and workplaces. This also informed the choice of appropriate photography to reflect the diversity in demographics. All these elements come together to make a site that directly and quickly connects with its visitors. Of primary importance is for visitors to quickly find what they need, so emphasis was placed on the prominence of ‘Need Help’ information across the site. No-one should have to look hard, scrolling and clicking, to find the right number to call or advice when it really matters. To support the array of organisations and initiatives that work in mental health we built a ‘Directory of Suicide Prevention Education and Training Resources’ and made sure that it was filterable, to allow visitors to quickly find what they need. This was also applied to their Events calendar. Incorporating accessibility was important too, especially for vulnerable people, and in adherence to all of government policy for online resources. The result is a user-friendly site that the MHC are active in updating themselves with news, initiatives and plenty of video.